Offering fun for the whole family is Splash, Panama City Beach’s newest beachfront resort. Splash offers one, two and three bedroom condos that over look the Gulf of Mexico. The whole family can have a splashin’ good time at Splash. They offer unique amenities that are sure to “wet” your palette for a good time. Imagine mom and dad enjoying the heated pool and/or Jacuzzi with a view of the kids at the miniature water park. Splash Panama City Condos for Sale – Splash is the perfect destination for families who want to pamper themselves and get away from it all. Families can spoil themselves with pampering and loads of quality family time. You’ll notice the unique and fun amenities from the get go when you come through the sky walk entrance and discover the arcade! Splash beach resort is truly one of the most unusual beach resort locations you’ll ever find. You’ll find the expected, property that hugs the coastline of some of the world’s best beaches. Then, you’ll also find the unexpected in the dive-in theater and lazy river. There’s something for every member of the family to enjoy here! You never have to leave the property in search of a good time! Come discover the good time in beautiful surroundings that await you at Splash in Panama City Beach, Florida! 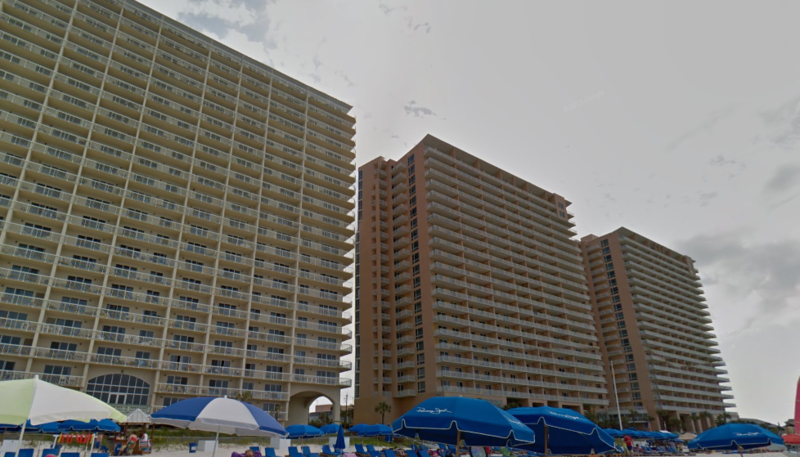 If you are traveling to Panama City Beach with your young children Splash condos is a great place to consider. This resort is the only one that offers a water park in the ground floor of the building right next to the beach. Traveling with young children takes a little more work and having kid friendly activities right inside your resort is a plus especially if you have been out and about enjoying all the great things Panama City Beach has to offer. It is nice to be in a resort where you can just stay in and take it easy for a while. The water park at Splash of course is the main attraction for staying there. You will find a covered portion of water park great if the weather is not the best outside. There are a few slides and a fun large dumping bucket that older kids will enjoy. If you have young tots they will love the splash pad area. There is also a lazy river between the covered water park area and the white sandy beaches of Panama City Beach. Grown ups will enjoy the hot tub and poolside bar. Of course the thing that Panama City Beach is most famous for is the sugary white sand beaches on the gulf coast. Splash offers one of the shortest distances between the resort and the water. You will not have to lug large amounts of kid necessities for far distances before you find a good spot next to the coastline where you can watch kids play in the water. Some vacationers even like to leave their things set up on the beach and allow their littles to go back and forth between the gulf and the water park. Each condo unit in Splash has a balcony overlooking the water. One good thing to know is each unit is owned independently so no too are alike. Reading reviews of the particular unit you are interested in using or purchasing is a good idea. Most units have open floor plans with kitchens overlooking family rooms. Kitchens are spacious with full refrigerators and large granite islands with breakfast bar that seats many. If you are looking for a great family friendly place the kids will love Splash is a good fit. For more information on units available in the Splash condo building or any Panama City Beach Condo please feel free to contact us at anytime.